Raymundo Frasquillo Photo/Gila Herald: Senior Alani Blair backhands a return, ending with one of three Pima singles and two doubles wins over Duncan opponents. Pima edged Duncan 5-4 on March 21. DUNCAN – The Shannon Kempton-coached No. 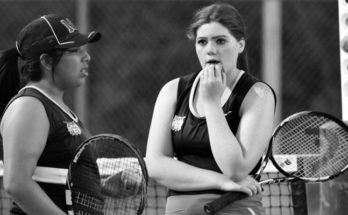 18 Duncan (3-2 seeding record) tennis girls welcome No. 9 Safford (5-1) Monday, March 25, visit No. 34 Benson (1-4) Tuesday, March 26, and host No. 1 Thatcher (7-0) Thursday, March 28. Duncan (3-2 section) is third in the Division III – Section I standings through March 22, behind Thatcher (6-0) and Safford (4-1), and ahead of Pima (2-4), Willcox (2-4), Morenci (1-4), and Benson (1-4). Raymundo Frasquillo Photo/Gila Herald: Sophomore Kinsley Rapier readies a serve against Allison Lunt. The Pima sophomore won 11-9. 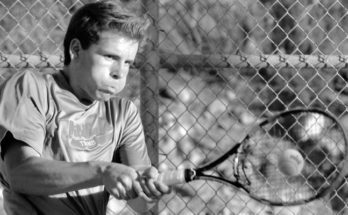 The Wildkats are 16-14 in singles and 6-9 in doubles, including a forfeit loss both in singles and doubles. In singles, No. 1 senior Brooklyn Kempton is 2-3, No. 2 junior Kaitlyn Lunt 5-0, No. 3 sophomore Melissa Claridge 4-1, No. 4 junior Lynnie Neilson 3-2, No. 5 sophomore Kinsley Rapier 2-3, and No. 6 freshman Ella Jernigan 0-4. The No. 1 Kempton – Claridge duo is 3-2, No. 2 Lunt – Neilson 3-2, and No. 3 Rapier – Jernigan 0-4. Last week, the Wildkats split two section matches, topping Willcox 6-3 in Cochise County March 19 and falling 5-4 to visiting Pima March 21. Duncan prevailed in three singles and one doubles pairings. 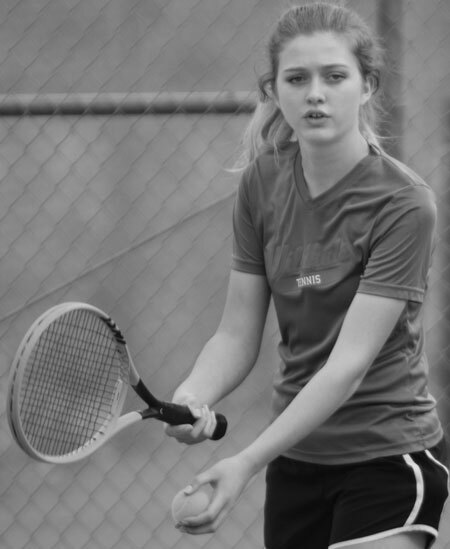 The wins were by Lunt (10-3 over senior Reah Matthews), Claridge (10-7 over senior Kamry Bryce), and Neilson (10-1 over senior Kiora Wood) in singles, and by Lunt – Neilson (8-0 over Matthews – Wood) in doubles. 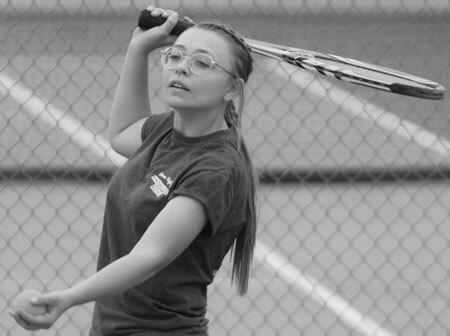 Raymundo Frasquillo Photo/Gila Herald: Duncan freshman Ella Jernigan looks the ball into her racquet to make a return. She is in the No. 6 slot. The Wildkats downed Willcox 6-3 on March 19 and were edged 5-4 by Pima on March 21. For Pima, the singles wins were by senior Alani Blair (10-6 over Kempton), sophomore Allison Lunt (11-9 over Rapier), and junior Kenzie McWhorter (10-2 over Jernigan). In doubles, Blair – Bryce (9-8 over Kempton – Claridge) and Lunt – McWhorter (8-2 over Rapier – Jernigan) had wins. Raymundo Frasquillo Photo/Gila Herald: Junior Lynnie Neilson checks the court before delivering a serve. The Duncan No. 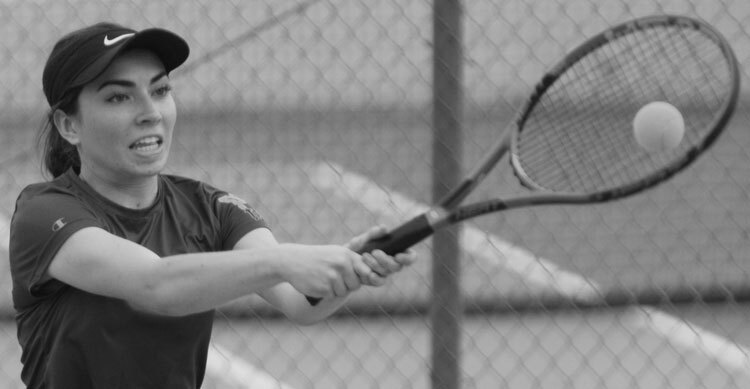 4 player posted a pair of singles wins and along with partner Kaitlyn Lunt, in doubles as well last week. The Wildkats triumphed in four singles and two doubles pairings. A 10-5 tie-breaker favoring Lunt decided a singles pairing kept the Eagles from making it a clean sweep. Thatcher junior Savanna Turley won the first set 6-1 and Lunt the second 6-4. 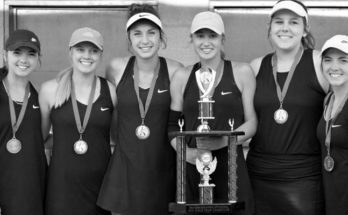 Kempton (8-6 over senior Allison Melton), Lunt (8-2 over senior Abby Bull), Claridge (9-7 over senior Kayla Ellisor), and Neilson (8-2 over freshman Jodi Denny) each won singles matches. The doubles wins were by Kempton – Claridge (8-2 over Blair – Bull) and Lunt – Neilson (8-5 over Ellisor – Hansen). For Pima, sophomore Sydney Hansen (8-5 over Rapier) and freshman Kamrielle Wyatt (8-0 over Jernigan) both won singles pairings and Hansen – Wyatt (8-3 over Rapier – Jernigan) had the doubles win.